"This was served at a dinner I went to recently. I am not familiar with cooking parsnips, but this dish was delicious. I hope to try it soon." Place parsnips into a large pot and cover with water; bring to a boil. Reduce heat to medium-low and simmer until tender, 20 to 30 minutes. Drain and cool slightly. Beat parsnips, melted butter, sherry, heavy whipping cream, salt, and white sugar together in a bowl until smooth. 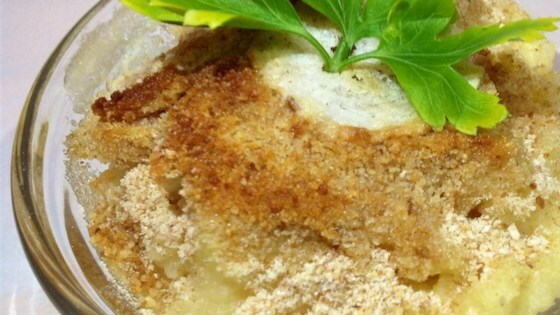 Spoon into a baking dish and top with bread crumbs; dot with butter pieces. Bake in the preheated oven until golden, 25 to 30 minutes.